Home >> Analysis and Features >> Emirates continues A380 operations at Mumbai. What are Lufthansa’s options? 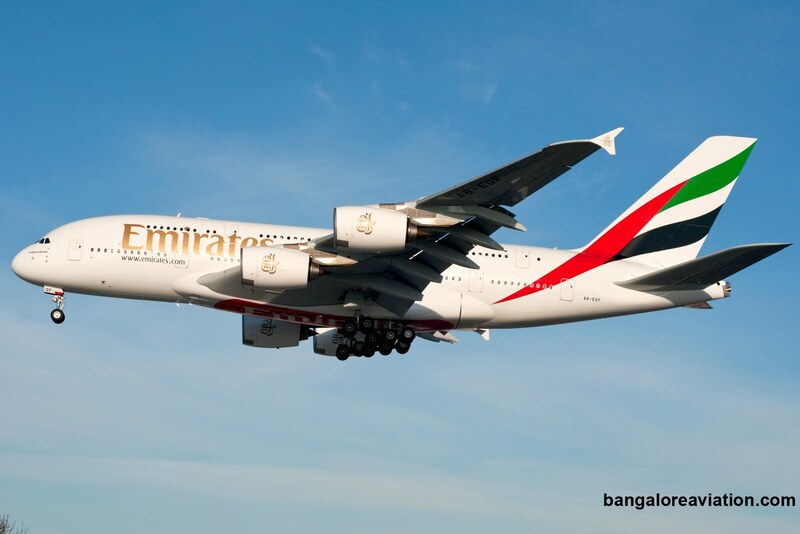 Dubai-based Emirates will continue operating its A380s in the prized early morning slot at Mumbai. 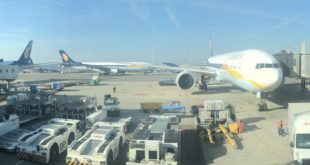 This announcement once again highlights the shortage of Code-F gates at Mumbai’s Chhatrapati Shivaji airport and puts in to doubt the proposed A380 service by German carrier Deutsche Lufthansa AG between Frankfurt and Mumbai. 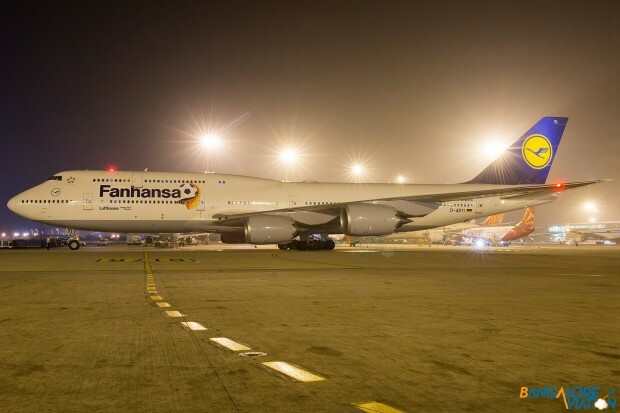 READ ONLINE: Lufthansa to commence A380 operations to both Mumbai and New Delhi this winter? The airport has only one Code-F gate at present. The Emirates flight, EK500, arrives in to Mumbai at 02:15 and departs at 04:15. The Lufthansa flight, LH756, is scheduled to arrive at 01:10 and depart at 03:05. 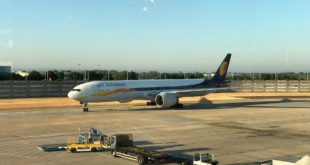 Till the additional Code-F gates are built in about 15 months time, the airport can accommodate only one of the two airlines’ super-jumbos at a time. There is little doubt that Lufthansa needs to upgrade the Boeing 747-400 (B744) it operates on the daily Mumbai Frankfurt flight. Lufthansa’s ageing 747-400 lacks even the most basic requirement of the modern premium class; a flat bed seat. The hard cabin product of competitors, even from group members like Swiss, are way ahead, and this is costing the Germans in market share. Unfortunately, both of Lufthansa’s large aircraft, the Boeing 747-8i and the Airbus A380, are Code-F class aircraft. So what are the options for the Germans? We asked Lufthansa about its plans in light of the developments with Emirates. The airline responded [bsu_quote cite=”Lufthansa spokesperson”]Lufthansa already operates A330, A340 and B747 on its routes from Mumbai, Delhi, Chennai, Pune and Bangalore to Europe. We are pleased to say that in view of the growing demand we plan to introduce the A380 in Mumbai and Delhi subject to government approval. We have applied for permission and are hopeful of getting government approvals soon. [/bsu_quote]It appears Lufthansa has not yet received permission from the civil aviation ministry to operate the A380 to India. Lufthansa Boeing 747-8i D-ABYI “Fanhansa” Livery. The best option, in our opinion, is for Lufthansa to operate the Boeing 747-8i at Mumbai. The existing bi-lateral air services agreement with Germany permits all variants of the Boeing 747. Inside, the aircraft is fitted with the new business class and now with the newly introduced premium economy class, which the airline’s A380s will be fitted with last. Externally, though its wingspan designates it Code-F, the Boeing 747-8i can be parked on a Code-E stand, which Mumbai has more of, with some adjustments in the neighbouring bay. 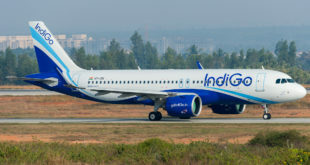 However, the availability of this aircraft may be an issue due its strong performance in high yield markets. If Lufthansa insists on going with the A380, one option would be for it to advance the schedule flight by 50 minutes, the amount of overlap with Emirates. Unfortunately, the Singapore Airline’s A380 flight departs at 00:25 and there would be a schedule conflict. Additionally, there needs to be some breathing room between flights. A hard option for Lufthansa would be to negotiate with both the airport operator MIAL and Emirates, and find a middle ground, may be getting Emirates to shift its schedule by 15 minutes? But then, why should Emirates give any quarter to a bitter competitor? The announcement by Emirates, the largest foreign airline at Mumbai, underscores the influence it enjoys with the airport’s operator, MIAL. 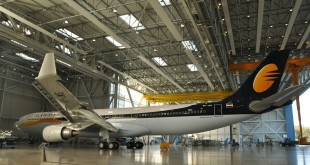 Despite announcing its schedule first, in early May, Lufthansa was forced to abandon its plans to operate its Boeing 747-8i to Mumbai just one week before the service was to commence in July. At that time too, the slot was given to Emirates even though it had announced its A380 flight almost three weeks after Lufthansa. Questions are being raised why MIAL broke with the tradition of “first come first served” to allocate the solitary gate to Emirates? We have been unable to reach MIAL for a comment. What are your thoughts on this whole development? Does Lufthansa need to upgrade its product ex Mumbai? What are its options? Is MIAL behaving in a fair manner? Share your thoughts via a comment.